There's little doubt about the continued adoption of videoconferencing and telepresence applications over the past few years. Clearly, growth has been fueled by the increasing popularity of video communications among multinational companies around the world -- particularly with mobile video chat applications that utilize new handheld devices. According to IDC's latest market assessment, the videoconferencing and telepresence market will continue to be one of the fastest growing networking markets for the foreseeable future. "Growth has been spurred on by more well-defined video use cases among organizations across a range of vertical market segments, including healthcare, higher education, financial services, legal, law enforcement, manufacturing, and retail," said Rich Costello, senior analyst, Enterprise Communications Infrastructure, at IDC. Other industry analysts are equally enthusiastic about the market outlook, as more enterprise users find new ways to connect and collaborate with internal and external stakeholders via traditional video meeting rooms and other more flexible video endpoints. Infonetics Research released excerpts from its fourth quarter (4Q11) "Enterprise Telepresence and Video Conferencing Equipment" report, which analyzes markets and vendors by region. "Sales of telepresence and videoconferencing equipment surged in the past two years, with growth accelerating in 2011 as video took off on enterprise IP PBX systems" said Matthias Machowinski, directing analyst for enterprise networks and video at Infonetics Research. The video conferencing market is being fueled by a confluence of factors, including the proliferation of video-capable equipment, demographic and communication trends that favor video, and industry use cases -- such as tele-learning and tele-medicine. Most importantly, the video collaboration market is being driven by increasing demand across a growing number of industry verticals that use the technology today. The global enterprise video conferencing and telepresence market jumped 15 percent to $882 million between the third and fourth quarters of 2011, setting a record high for quarterly revenue. For the full year 2011, sales of videoconferencing and telepresence equipment are up 34 percent to $2.99 billion. Infonetics expects a cumulative $22 billion to be spent by enterprises on videoconferencing and telepresence hardware and software from 2012 to 2016. PBX-based systems had the strongest performance for the year, growing 80 percent, as they offer a cost-effective way to enjoy multi-modal communication using existing infrastructure. 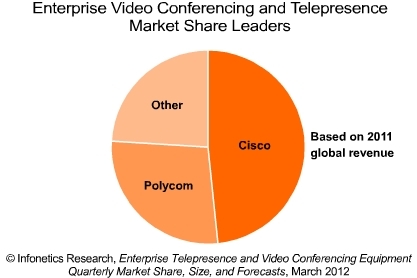 Market leader Cisco shows no signs of slowing down: its 4Q11 telepresence and videoconferencing revenue jumped 25 percent sequentially and market share is up 3 points to 52.5 percent. Dedicated multi-purpose room video systems made up over half the enterprise videoconferencing equipment market in 2011 and will continue to be the biggest revenue-generator among enterprise video solutions. Sales of videoconferencing infrastructure and endpoints are strong in all major world regions, but the standout region is the Caribbean and Latin America (CALA), which saw sales nearly double in 2011. According to a new market study by Cisco, a majority (60%) of IT decision makers from North European countries believe the ability to work remotely leads to increased productivity -- and it is no longer necessary to be confined to an office to be productive. Although these IT decision makers believe technology (such as business tablets) allows them to be more mobile and flexible, more than half (56%) of those surveyed -- led by those in Norway and The Netherlands -- work one or more extra hours per day as a result of the ability to work remotely. In Northern Europe, there is a growing need for remote access to the company network, social media access in the workplace and for the freedom to use personal devices for business purposes -- also known as "Bring Your Own Device" or BYOD. This trend can have a significant impact on the IT policies of organizations and among end users who are employed by companies with IT policies -- as the study also found that nearly half (47%) indicate their IT policy could use improvement or updating. That's the primary conclusions from an online survey held by Cisco in five countries: Belgium, Denmark, Norway, Sweden and The Netherlands. The results of this North European survey complement and confirm the findings of last year's Cisco Connected World Technology Report -- an international research into the demands, behaviour and work lifestyles of the next generation of workers. In addition, the survey found that when faced with the choice between "a higher salary and no remote access" versus a "lower salary position that offers remote access," end users are split, with one out of every two respondents (53%) opting for a lower salary, because they find work flexibility more important. With little differentiation across the countries, more than 6 out of 10 (65%) end users expect to have remote access to the network in the future. Looking at the use of mobile devices, end users from Northern European countries tend to use more than one device during the typical workday: more than 8 in 10 (82%) end users indicate they use at least one device at work that is not company-issued. More than half (51%) of the surveyed IT decision makers even indicate that up to 50% of their company's mobile workers use a smartphone as their primary communication device. Overall, most businesses in the surveyed countries have at least taken some steps to prepare for a "mobile and distributed" workforce. Still, 1 in 5 IT decision makers (21%) indicate that their company is as yet completely unprepared. The highest percentage of unprepared businesses is reported in Norway (26%). In The Netherlands, 14% of decision makers indicate that their company is totally unprepared. In each country, roughly one-third (36%) indicate they are actively working towards enabling a mobile, distributed workforce, especially in the Netherlands (45%). Surprisingly, although Norway reports the largest percentage of completely unprepared companies, it also has the highest proportion of companies that already have state-of-the-art IT support for a "mobile and distributed" workforce (34%), together with Denmark (31%). In that respect, Netherlands (14%) and Belgium (12%) trail the pack. Few end users (less than 1 in 5, 19%) report that access to social media type websites and applications is restricted at the workplace. Likewise, about 6 in 10 IT decision makers (59%) -- particularly those in Denmark -- feel that access to social media sites and applications are important for the work-life balance, or staying competitive with other businesses that use them. "Our Workforce Survey in Northern Europe confirms that employees really want an open and flexible workplace environment. The survey indicates that IT decision makers want to accommodate this requirement and in a secure way enable a mobile, distributed workforce. Most end users in the surveyed countries indicate that they work an extra hour or more per day because of their ability to work remotely. This shows BYOD brings the productivity we are looking for," said Niels Furu, Vice President, Cisco Northern Europe. While most commentary about managed cloud services tend to focus on the advances in commercial enterprise applications, government agencies are also making noteworthy progress. In particular, the advent of regional community cloud hubs is a phenomenon that's worthy of further exploration. According to their latest market study and related report, IDC Government Insights believes regional cloud hubs will significantly change the way state and local governments procure online computing services. These regional cloud hubs, defined as one government agency offering computing and storage services to other government agencies, have proven successful in the State of Michigan and State of Utah. In addition, the IDC's research provides a framework for building similar regional cloud solutions. According to Shawn McCarthy, research analyst, IDC Government Insights, "We believe that cloud hubs will see rapid growth, since the first multi-agency efforts have already shown a positive return on investment and solid service levels for cloud solutions subscribers." Cloud computing is rapidly changing the way government organizations consume computing resources. This comes at a time when virtualized servers and efforts towards application standardization have merged many government solutions. IDC says that as solutions merge, less data center space is needed. In fact, by the end of 2012 close to 40 percent of federal data centers will be shuttered. Many state governments are following a similar path, often combing multiple data centers into one or two large statewide operations. Remaining data centers often serve as a shared computing and storage resource for multiple departments. While any level of government can, in theory, offer services to any other government office, state-level governments are often most qualified to serve as regional hosts -- offering government-to-government services to other state agencies or to local municipal government entities. Local governments are already looking for trusted cloud providers -- and for ways to significantly reduce their growing IT costs. Through these cooperative arrangements, the government sites are able to leverage private cloud services including software as a service, infrastructure as a service, online storage, and security as a service, among others. Being able to purchase services through high volume state contracts can give local governments a substantial pricing edge. In addition, moving to a shared service environment also helps local governments conform to broader data standards and gain access to streamlined reporting tools that can be hosted right on the shared system. "In general, the larger government operations that already manage complex IT systems will evolve as the most likely regional hosts," said McCarthy. "Smaller government agencies may choose to get out of most IT hosting and management operations, as long as they can find reliable, affordable and privately hosted solutions through the cloud." According to IDC, these managed cloud solutions often require zero to moderate capital expenditures and are developed in-house or are commercially developed private clouds -- dedicated to government use and designed to meet specific government standards. For the host facility, it can turn a government agency cost center into a revenue center. By selling cloud solutions to other government organizations, host agencies can offset their own IT costs. Local governments can buy cheaper cloud solutions than they might find on their own and they may be able to reduce capital expenditures and overhead costs. Cloud services will replace internal client/server systems as the main model for government application delivery. The race is on to build shared regional data centers and the largest portfolios of government solutions. The IDC Government Insights report features two U.S. states, Michigan and Utah, both well on their way to building cloud hubs that can be used by multiple government agencies at various levels of government. In addition, the report highlights several regional multi-state cloud computing efforts.